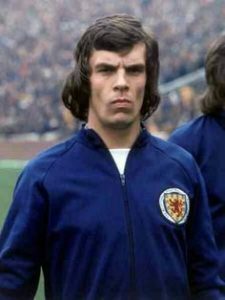 A FIERCESOME striker of some repute, Joe Jordan etched his name into football folklore when he scored the crucial goal against Czechoslovakia in 1973 that ended Scotland’s 16-year absence from the World Cup. He then added to his legacy by becoming the first – and only – Scot to score in three finals in succession against Zaire in 1974, Peru in 1978 and the old Soviet Union in 1982. Joe went on to amass 52 caps for his country, scoring 11 goals, and was inducted into the Scottish Hall of Fame in 2005. He began his senior club career with Morton before moving south to join Don Revie’s all-conquering Leeds United team of the 1970s. Part of the so-called Scottish mafia, Joe won the 1974 English first division and played in both the Cup Winners Cup and European Cup finals. He subsequently signed for Manchester United before moving to Italy, playing first for AC Milan and then Hellas Verona. Upon his return to England he had spells with Southampton and Bristol City, before managing City (twice), Hearts and Stoke City. He has also served as an assistant manager for Celtic, Northern Ireland, Huddersfield, Portsmouth, Spurs and QPR.